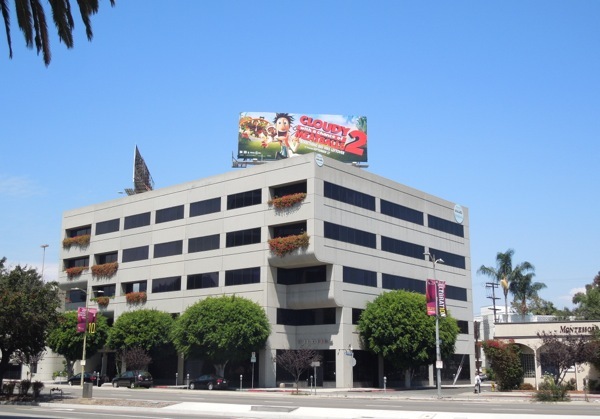 This summer has been crammed with animated feature films, from sequels like Monsters University and Despicable Me 2, fresh starts like Epic and spin-offs like Disney's Planes, to box office disappointments like Turbo. 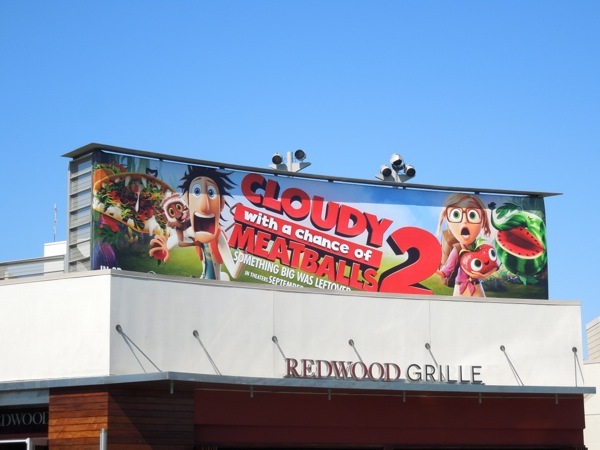 By this stage are audiences feeling a bit fatigued, or has enough time passed for another computer-animated sequel in the form of Cloudy with a Chance of Meatballs 2? 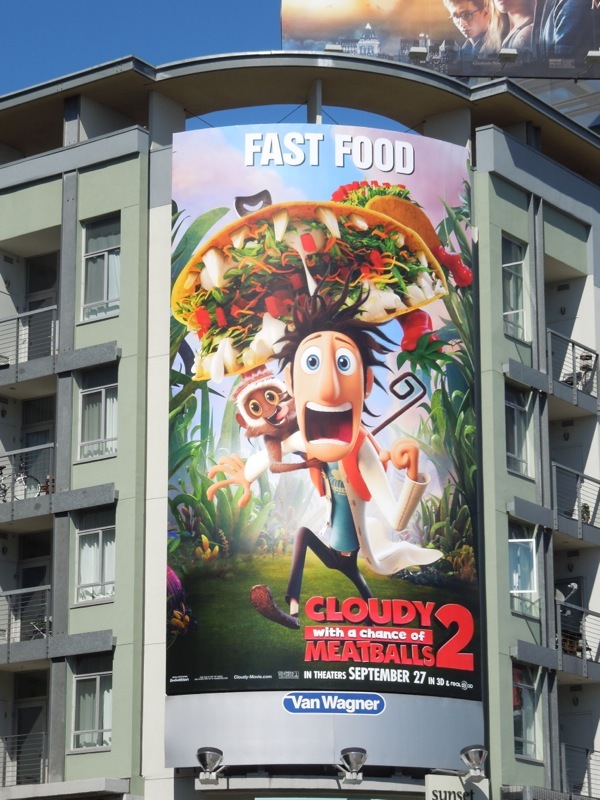 A frantic 'Flint Lockwood' fleeing from a mutant food beast brought to life by his machine invention makes for an excellent visual and the perfect imagery to attract its young target audience. 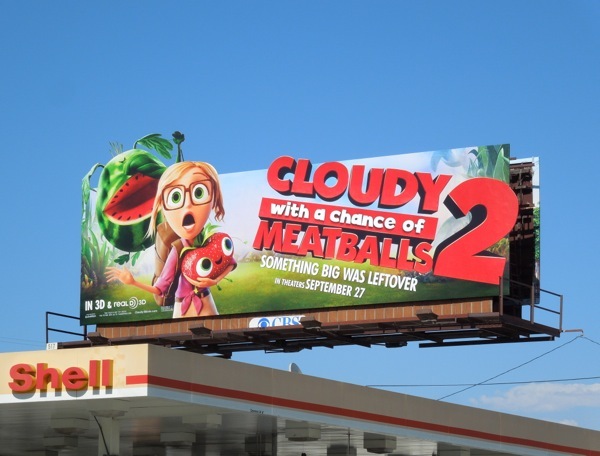 Even the tongue-in-cheek foodie tagline, 'Something big was leftover', is a lot of fun. 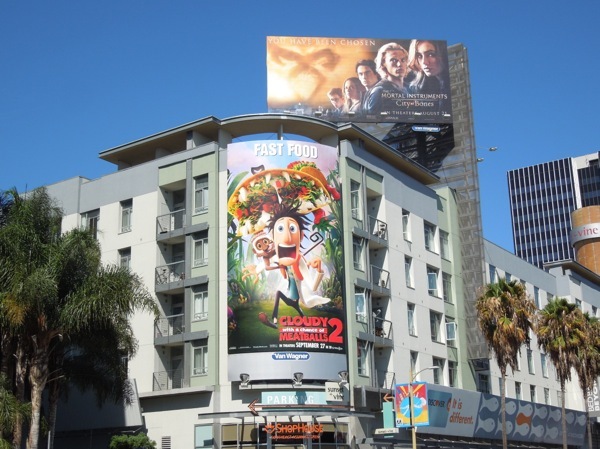 The colourful special extension billboard was spied along Sunset Boulevard and the standard landscape billboard was spotted high over San Vicente Boulevard on August 19, whilst the vertical ad creative was snapped at Sunset & Vine in Hollywood on August 20, 2013. 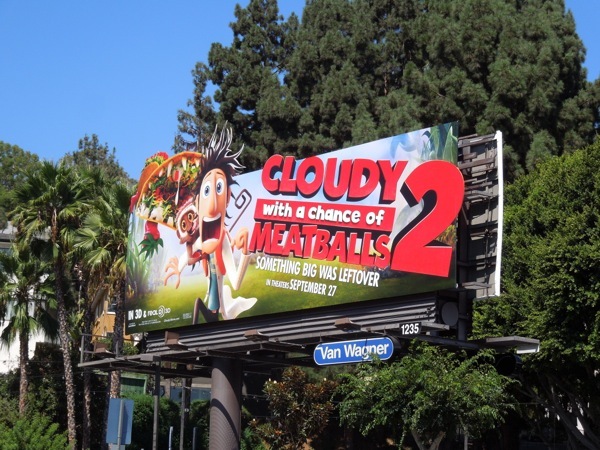 If you're a fan of this animated movie franchise, be sure to check out these Cloudy with a Chance of Meatballs billboards from 2009. 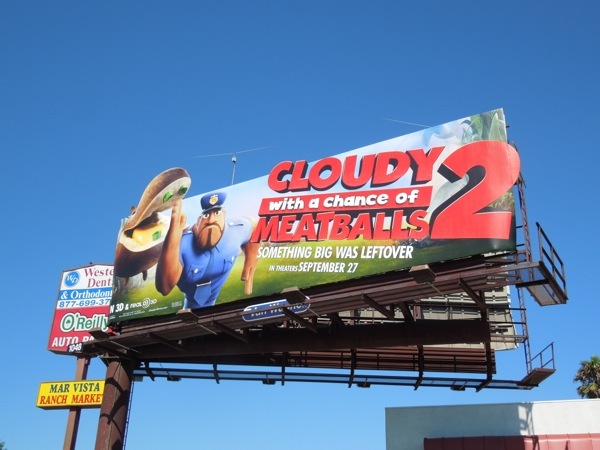 Let's hope this comedy sequel has a meaty enough plot to warrant this second installment. 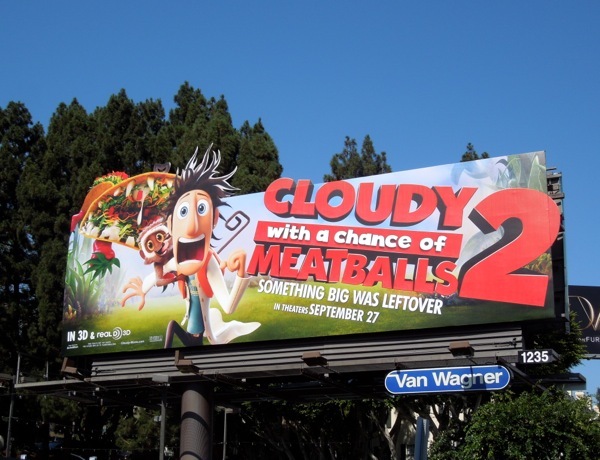 UPDATED: The advertising campaign for Cloudy with a Chance of Meatballs 2 appears to be in full swing here in L.A., as on the way back from Venice Beach recently Daily Billboard spied a trio of consecutive billboards headed east along Venice Boulevard on September 3, 2013. 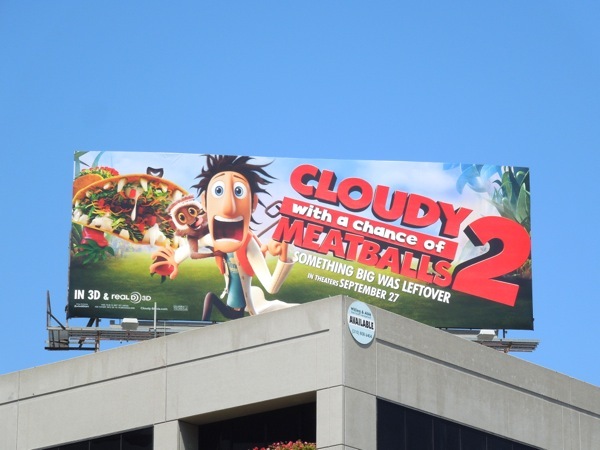 Not only was there a Flint Lockwood special extension for the movie sequel, but Flint's love and plucky weather reporter wannabe 'Sam Sparks', plus Swallow Falls policeman 'Earl Devereaux', get their own eye-catching ad creatives being chased by the mutated 'foodimals'. 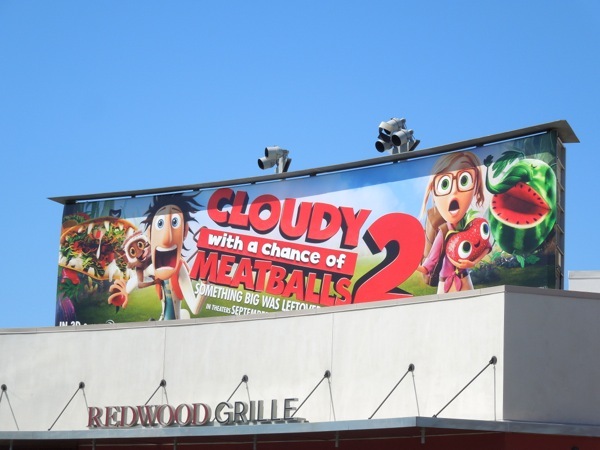 Meanwhile another large billboard for the movie could be found towering over the open-air shopping centre Santa Monica Place on September 6, 2013. 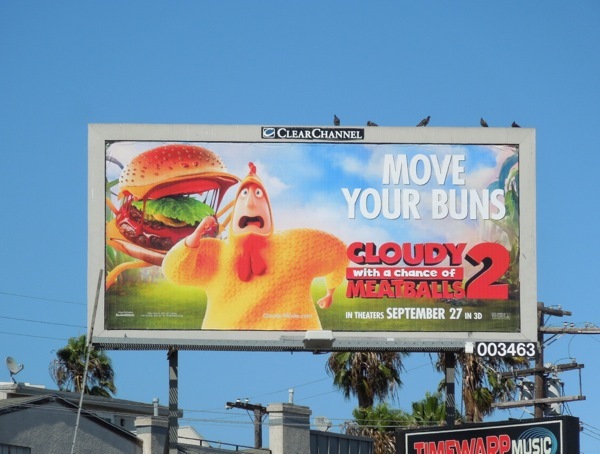 Plus 'Brent McHale' in a chicken suit comically being pursued by a mutated cheeseburger with the tagline 'Move your buns' is another fun food-themed ad for the animated film and was also spied along Venice Boulevard. 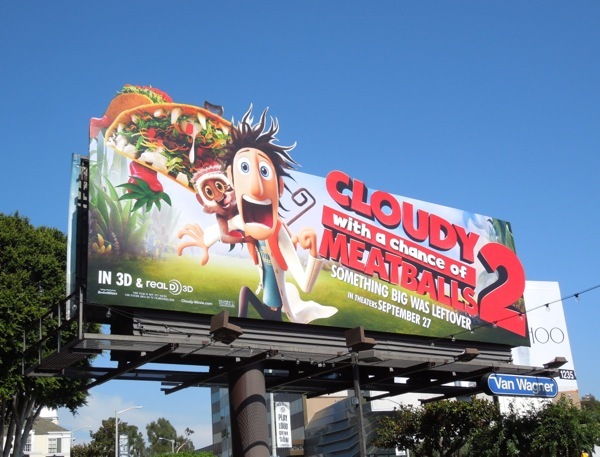 In his previous adventure Flint and his friends had to survive the weather turned to food, now can he survive against an onslaught of shrimpanzees, hippotatomuses and hungry tacodiles.